Tomsk was founded at the beginning of the 17th century at the official request of the Tatar duke of Eushta. He approached the Tsar to ask for some form of defence in this area, which was suffering at the hands of lawless robbers from Kyrgyzstan. Boris Fyodorovich Godunov, Tsar from 1598 to 1605, subsequently ordered the building of the village, and thus, the history of Tomsk began, more than four centuries ago. 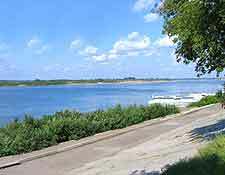 A strategic site was chosen at the meeting point of both the Tom River and the Ushaika River, and approximately 200 Cossacks were drafted in to begin construction of a fortress. The might of Tomsk saw this burgeoning town gain control of a number of ethnic settlements living nearby, to the south. By the arrival of the early 17th century, the village had managed to establish a good infrastructure and its community was steadily expanding. The year of 1629 was a memorable one in Tomsk history, since this growing village was awarded the status of a town. With so many wooden buildings built so close together, Tomsk was really a fire waiting to happen, and sure enough, in 1643, a devastating fire swept through the entire town. The fire destroyed everything in its path, including the fortress. Not deterred by this catastrophe, the locals began to rebuild their town, including the fortress, which was encircled by a lengthy wooden wall with a number of lookout towers. 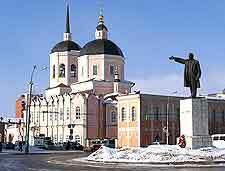 Being situated towards the end of the Moscow to Siberia route, Tomsk began attracting both visitors and emigrants. By the late 1730s, the town was beginning to draw various tradesmen, including blacksmiths, who set up shop here and added their skill base to the community. In the year of 1804, Emperor Alexander announced that Tomsk was to become the prestigious administrative centre of the region. Now a city, it was to preside over an expansive area, including Eastern Kazakhstan, Kemerovo and the Novosibirsk region (then named Novonikolayevsk), as well as the Altai Territory. This was a real turning point in the history of Tomsk and a new chapter of prosperity began. A local council was formed and a number of official buildings for the new administration soon arrived, including a town hall, churches and even a police building. With the population set to increase further, more houses were built, many of which were now constructed in stone. The wealth of the city was further increased when gold was discovered nearby at the beginning of the 1830s. However, the city was rather surprised when it was announced that the Trans-Siberian Railway of the early 1890s was to bypass Tomsk altogether, instead connecting Novosibirsk, to the south-west. 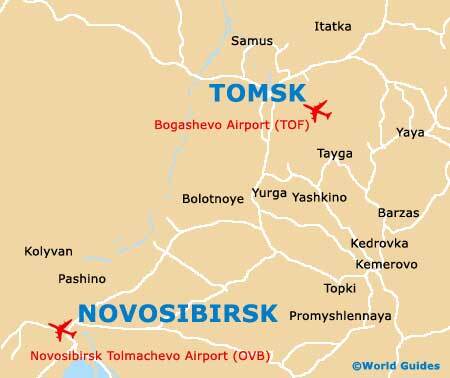 This was the start of the gradual demise of Tomsk, and the subsequent rise of Novosibirsk. The city was to begin to attract exiles from other countries, who came to Tomsk to start a new life. Before long, the overall population was made up of some 20 percent of these exiles. The history of the city was looking rather uncertain, although a newfound confidence was to come in the form of both the Tomsk Polytechnic University and the National Research Tomsk State University, built in 1886 and 1888 respectively. The city soon became Siberia's true centre for educational excellence. The 1917 revolution saw Tomsk officially join the Siberian Territory, while soon after it became a part of the Western Siberia Territory. Towards the end of the 1930s, the city joined forces with its neighbours, becoming a member of the powerful Novosibirsk Oblast region. Many factories were erected in the city during the arrival of the First World War and a strong industrial period followed, right into the Second World War (1939 to 1945) and during the Great Patriotic War (1941 to 1945). Such was the growth and economic output that Tomsk drew the attention of the Soviet government, who decided to create a new administrative division here (oblast). A period of nuclear research followed, along with the discovery of oil and gas nearby in the 1960s. Tomsk remains a city of science and students, and at the beginning of 1991, the city's very heart was given the title of 'historic town', preserving the oldest buildings for future generations. Sightseers coming here can enjoy many beautiful landmarks, many of which line both the Ploshchad Lenina and the Prospekt Lenina. Those wishing to learn more about the city's interesting past will find that the Tomsk History Museum on Resurrection Hill is a good place to start, as is the Regional Museum within the Atashev Palace.